Exxon Mobil Corporation engages in the exploration, production, transportation, and sale of crude oil and natural gas. The company is a component of the S&P 500, Dow Jones Industrials and the Dividend Aristocrats indexes. Exxon Mobil has been consistently increasing its dividends for 27 consecutive years. 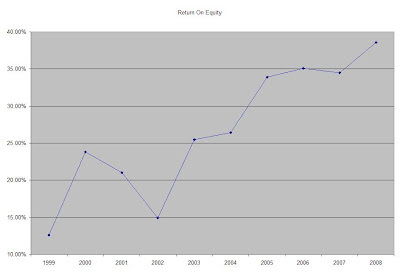 From the end of 1998 up until December 2008 this dividend growth stock has delivered an annual average total return of 10.50% to its shareholders. At the same time company has managed to deliver an impressive 25.40% average annual increase in its EPS since 1999. The forecasts for the foreseeable future are for a 40% -50% contraction in the EPS in 2009 followed by an increase in EPS to a $6 to $6.50 range in 2010. The sheer scale of the company gives it economies of scale. Its productivity is further boosted by the efficiency of developing new projects in Quatar, Norway and US. Exxon Mobil does business on over 200 countries and derives only 30% of its revenues from the US. The ROE has consistently increased from less than 13% in 1999 to over 38% in 2008. Annual dividends have increased by an average of 7% annually since 1999, which is much lower than the growth in EPS. Currently, the number of shares is lower than the number of shares at the time of the merger between Exxon and Mobil. The tremendous increase in commodities prices over the past decade has greatly contributed to the strength in earnings per share. A 7 % growth in dividends translates into the dividend payment doubling almost every ten years. If we look at historical data, going as far back as 1963, XOM has actually managed to double its dividend payment every eleven years on average. Just a few days ago Exxon boosted its dividend by 5% for the 27th year in a row. The dividend is very well covered at the moment. The dividend payout has declined from a high of 74% in 1999 to a low of 18% by 2008. A lower payout is always a plus, since it leaves room for consistent dividend growth minimizing the impact of short-term fluctuations in earnings. The company has returned money to shareholders exclusively through share buybacks, which are typically not as consistent as increases in dividends. Despite the low dividend payout ratio and low P/E ratio, I would need a dividend yield of at least 3% to initiate a position in XOM. I would appreciate it greatly if the company increases its payout of dividends over time at the expense of reducing its massive share buybacks. XOM has the potential to achieve an above average dividend growth over the next decade if oil prices increase over the next few year. In comparison Chevron Corporation (CVX) trades at a P/E multiple of 5.60 and yields 4.00%, while British Petroleum (BP) trades at a P/E multiple 5 while yielding 8.40%. I would consider initiating a position in Exxon Mobil on dips below $56.